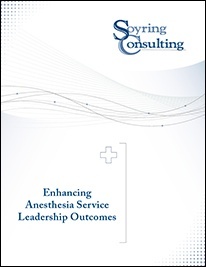 How Can Optimal Anesthesia Service Leadership Ultimately Improve Outcomes? Anesthesia Services has a primary role in the delivery of patient care in Perioperative Services, as this group touches every main aspect and area involved in surgery. Perianesthesia is positioned for a high level of interdisciplinary leadership within Perioperative Services. Thanks to past achievements such as approaches that consider practice and culture in areas of reduced blood stream infections, reduced mortality, safer drugs, and improved monitoring, the healthcare system recognizes the knowledge and skills of Perianesthesia. Download now to learn tips for organizing the Anesthesia Department to support both Perioperative Services and Anesthesia Services for optimal leadership and ultimately improved outcomes. Soyring Consulting provides managerial and operational consulting services to healthcare facilities of all sizes, including For-profit, Not-for-profit, Community, University, and Faith-based facilities and systems. Soyring Consultants are highly experienced in conducting quality assurance reviews in all aspects of the hospital and their effectiveness to sustain facility best practices, as well as ensure the department or hospital is consistent with administrative rules, licensing standards, and state regulations.